When first learning to play golf, we realize that there is so much more to this game than just hitting a little ball. As beginners, most of us work on our game for several years before we feel like it is starting to come together. This was exactly how things happened for Donna DiCrisco, Brandywine Country Club, in 1993. Ms. DiCrisco was introduced to golf through her business and started as a beginner golfer in 1989. She, like many of us, played a few times and got hooked. Lessons followed along. She started out shooting in the 100’s before finally breaking in to the 80s and competing in Championship flights in many DWGA tournaments. 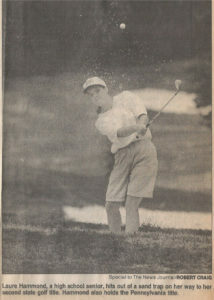 Terry Perry, Kennett Square Country Club, was another prominent DWGA player during the 90s. She had an outstanding game and was quite the competitor. 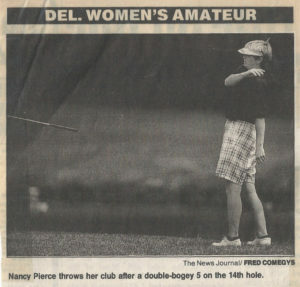 If by chance her game got a little off, she would see her local pro who just happened to be Harold Perry, her husband, head pro at Kennett Square Country Club. Think about that, your husband as your golf pro…hmmm. 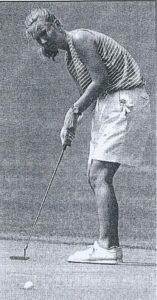 For about 12 years prior to the early 90’s Terry Perry was only recognized in golf as the wife of Harold but once she started competing she earned a name for herself and was known as a top-notch lady golfer. Terry was guided by a patient approach to golf, staying calm on the course and not getting upset. Nancy Pierce, Coatesville, on the other hand, had a somewhat different way of expressing herself. 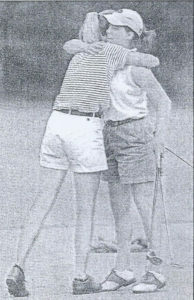 During the 90s the DWGA Junior Girls Championship Tournament provided an opportunity for competitive golf for young gals. Tournament director, Debbie Ryan, saw a tournament record number of entrants for the event in 1993 held at Delcastle. The program set up by the DWGA for Junior golfing gals, mentored a number of girls on their way to being exceptional players. 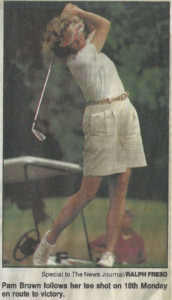 Laure Hammond, a high school senior won the Delaware State Junior Girls Championship in 1993. A quote from her in the newspaper write-up after her win. but actually I really think it helped. Laura Hammond, a high school senior, hits out of a sand trap on her way to her second state golf title. Hammond also held the Pennsylvania title. The first round of the 1994 Women’s Amateur Tournament at Garrison Lakes Golf Club was a tough one for the ladies. Temperatures were well in to 100s. Three time winner, Terry Perry, Kennett Square, encountered back issues and was forced to withdraw. With Terry Perry out, Pam Brown, Hercules, quickly took the lead. Janet Wolf, Chantilly Manor, tying for fourth after round one had a bout of vertigo. Janet stated she didn’t plan on getting dizzy from being high on the leaderboard, but she did note that she probably stayed a lot steadier over the ball because she didn’t want to make any sudden moves. Lord, she’s hot! Kelly Lord’s par putt on day 2 on the 18th hole for a round of 79. With all that occurred throughout the 3 days of the Delaware Women’s Amateur Tournament, the Champion still was not known on the final day as it ended in a 3-way tie. Three ladies, Gail Brown, Coatesville, Pam Brown, Hercules, and Kelly Lord, Penn Oaks, would all need to return for the playoff. Playing out of the trees, for a double bogey on hole 16, Pam Brown was quoted as saying, “I think my nerves started giving out.”. She would go on to win. She finished with a 76, 4 shots under Kelly Lord and 8 shots under two-time champion Gail Brown. The 1999 DWGA Senior Championship went to a 55-year-old grandmother of eight. Peggy Petrillo walked away with her second title in 3 years. She won the title at the North Course of Wilmington Country Club with a 10-stroke lead. 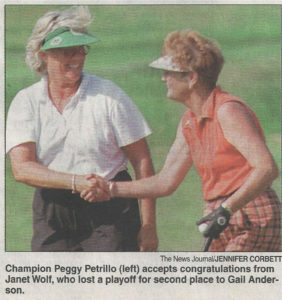 Peggy Petrillo took up golf at the age of 30 but had to wait until her children were grown before playing full-time. Her twenty-five years of lessons paid off. She represented Delaware at the United States Golf Association State Team Championships. Janet Wolf and Gail Anderson battled it out for second place in a 3-hole playoff. Gail Anderson ended up taking second place. From seniors to young amateurs, DWGA players enjoyed a competitive round but they equally enjoyed congratulating their opponent on a win as shown above in the ’99 Senior Championship and below Amateur Tournament. 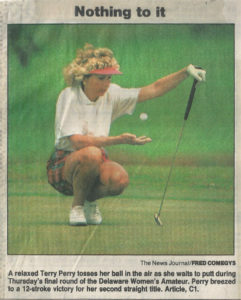 The 1999 DWGA Amateur Tournament was held at Newark Country Club, The title went to 19-year-old Collette Anderson. At this time in history, the DWGA welcomed a new, young generation of golfers. As if the extreme 100 degree temperatures weren’t enough during the Amateur, the game these kids had added even more heat for veteran DWGA lady golfers. Nothing though could ever keep DWGA ladies from playing golf. 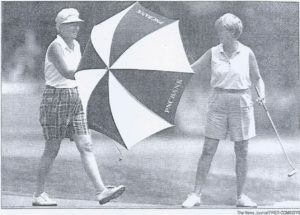 June Allen (right) hands an umbrella to Phyllis Pepper as a way to beat the heat during the DWGA Amateur at Newark Country Club.